Since I’m calling Ashley’s guitar the “Ashley Kingman Model” I wanted to put his name on it somewhere. I tried out a few options but they all seemed too obvious—I was looking for something subtle. That’s when I remembered that Ashley has gotten many famous guitarists to sign the back of his guitar’s headstock. 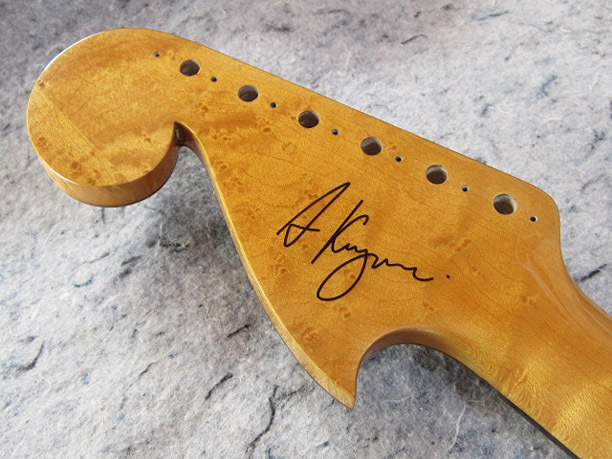 He has autographs from Scotty Moore, Les Paul, Paul Burlison and others on there, so it seemed only natural to put Ash’s signature in the same place on his new headstock. Here’s how it turned out.